The Oregon state lottery has teamed up with AMC to produce “The Walking Dead”-themed scratch-it lottery tickets for its game beginning this month. Players of the state’s lottery have their choices of two “Walking Dead” images on their Scratch-it tickets. 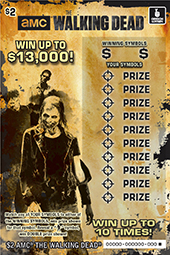 Playes have a chance to win $13,000 on either of “The Walking Dead” Scratch-it tickets as well other prizes up to 10 times.